It takes a village to care for a loved one with dementia. 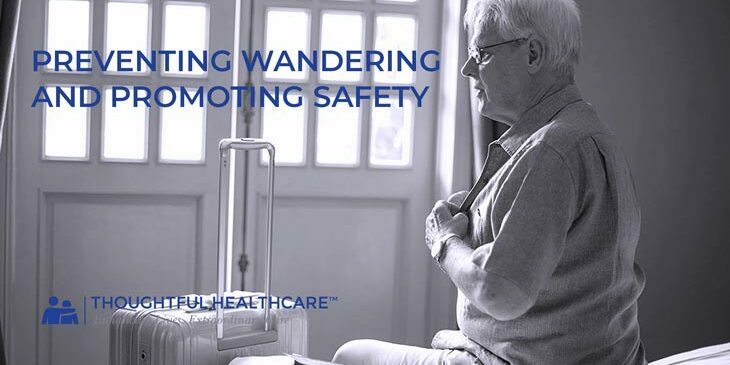 With this in mind, Tim Tholen, CEO and Founder of Thoughtful Health Care and its affiliates in Kansas City welcomed Chief of Prairie Village Police, Tim Schwartzkopf ​and Dr. James Birch, Jr.,​ Associate Professor of Family Medicine at The University of Kansas School of Medicine as guests to share their experience about wandering and safety. In the livestream video, “Preventing Wandering and Promoting Safety,” Tim leads a discussion about prevention and care of incidents inside and outside of the home. Go through the home and check for fall risks. Items on the floor, loose rugs, cords that are in the way, are all fall hazards, and should be removed or secured. Check safety in the bathroom. Install grip bars where needed and proper lighting. Removing knobs on kitchen appliances can prevent fires. When proper hygiene is being maintained, it shows that a loved one is able to take care of him or herself. When hygiene slips, it may be time to step in to help. Check regularly to make sure that foods in the refrigerator are fresh and consumable. Medications should be taken as directed. This is a big issue among people with dementia. Alarms or cameras can help to be sure the loved one is okay when the caregiver is away. Wandering is common among people with dementia. These are incidents when the loved one tries to find a person or place and becomes disoriented and lost. There are technologies that can be a help, such as GPS apps for the loved one’s phone. However, ensuring that the loved one will remember to carry the phone on a regular basis can be an issue. Call your local Sheriff’s Office to let them know that a person at a particular address has dementia. Give a description of your loved one. Ask neighbors to keep an eye out. Alarms and cameras can alert a caregiver if the person with dementia has left the house. When the problems outweigh the solutions, it’s an indicator that your loved one may need more care. Our professional caregivers at Kansas City Home Care are here to support your family in caring for a loved one at home. Please feel free to contact us for more information.